Two satellites of the old US-KS/Oko system that until recently maintained some coverage of ballistic missile launches, stopped functioning some time in the fall of 2014, leaving Russia without space-based tier of the early-warning system. 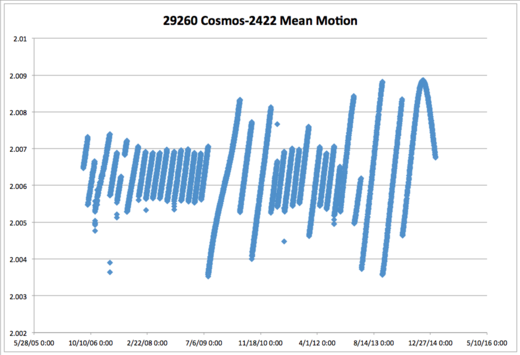 Cosmos-2422 (29260, launched in July 2006) failed to perform an orbit correction maneuver due in September 2014. 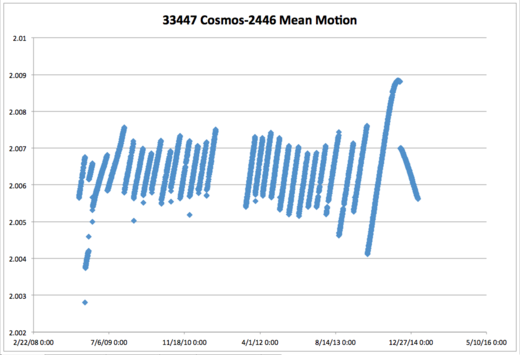 Cosmos-2446 (33447, December 2008) also failed in September-October 2014 and is currently drifting off its working orbit. The Kommersant newspaper, which first reported the news, appears to have an independent confirmation of the satellites' demise. These two satellites were old satellites of the 73D6 type that were deployed on highly-elliptical orbits and worked as part of the US-KS system to provide Russia with a capability to detect ballistic missile launches from the U.S. territory. 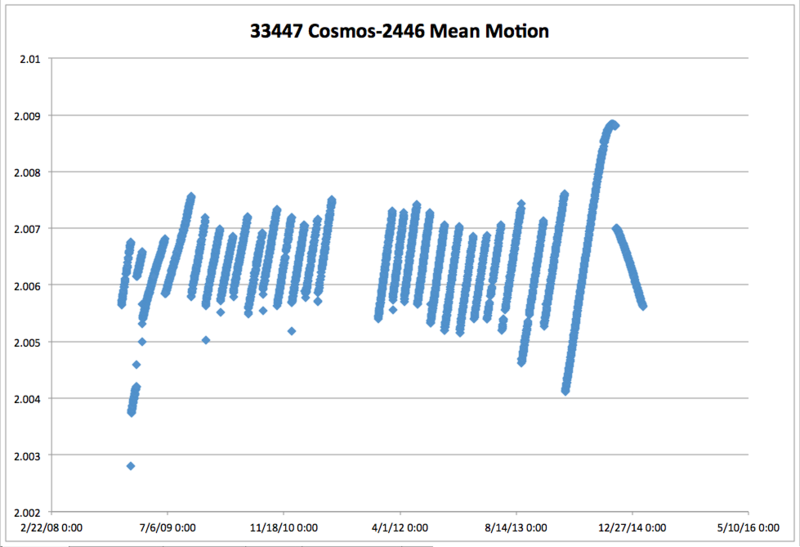 Each satellites was in a position to see the launches for about six hours a day. 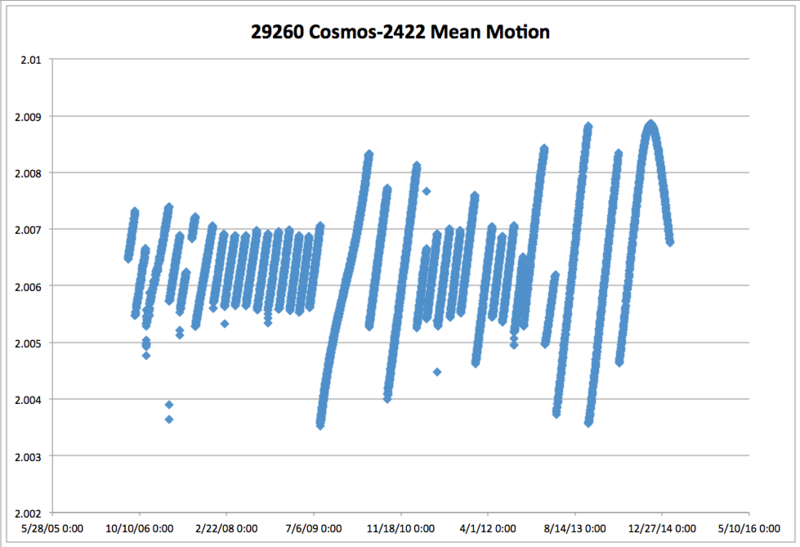 Technically, four satellites are needed to provide a 24-hour coverage, but a reliable detection required more than double of that amount - there were nine slots in the constellation plus one 73D6 satellite on a geostationary orbit (for more details, see my old Science & Global Security article). The US-KS system was supposed to be complemented by the 71Kh6 satellites of the UK-KMO system deployed on geostationary orbit, but that system has never became fully operational. The last 71Kh6 satellite, Cosmos-2479 (38101), launched in March 2012, stopped operations in March-April 2014. To deal with the reality of the very short detection times, the Soviet Union invested quite a bit of effort into building a command and control system that could provide insurance against a decapitating bolt out of the blue strike. The system included a number of arrangements, such as pre-delegation of authority and reliance on a number of backup communication channels that included the Perimeter command missiles (still operational, by the way). If you have a copy of the Russian Strategic Nuclear Forces book, check pages 59-66 for a detailed description (which I was told is quite accurate). If you don't have a copy, get one. In the end, there was a dual phenomenology of sorts, but the second tier was provided by the system that would detect actual nuclear detonations on the Russian soil. And, no, it was not an automatic Dead Hand. 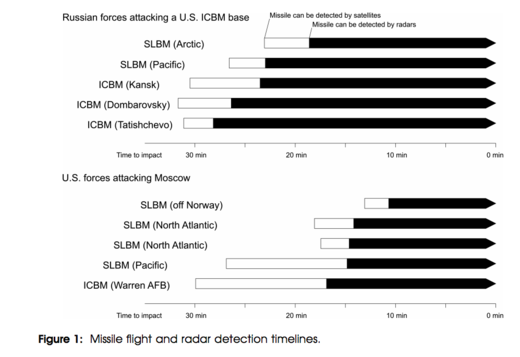 The bottom line is that space-based early-warning was a useful, but not a crucial component of the Russian early-warning system. So, it's a loss, but not a dramatic one. Russia, of course, is working on a new system, known as EKS. Way back in 2007 it was expected that the first satellite of the new system will be flown in 2009, but then it slipped behind schedule quite a few times. The satellite, named Tundra (14F142), was supposed to be ready for a maiden flight some time in 2014, but that didn't happen. Now, Kommersant reports that the launch is scheduled for June 2015. We will see. Pavel, there is information that in Tatischevo Division 7 regiments were rearmed on Topol-M: http://ria.ru/defense_safety/20150212/1047302713.html What could you say about this? I really can't see a "dead hand" type of system really ever being necessary unless launch warning times were to drop below the minimum time threshold for a viable retaliatory response. 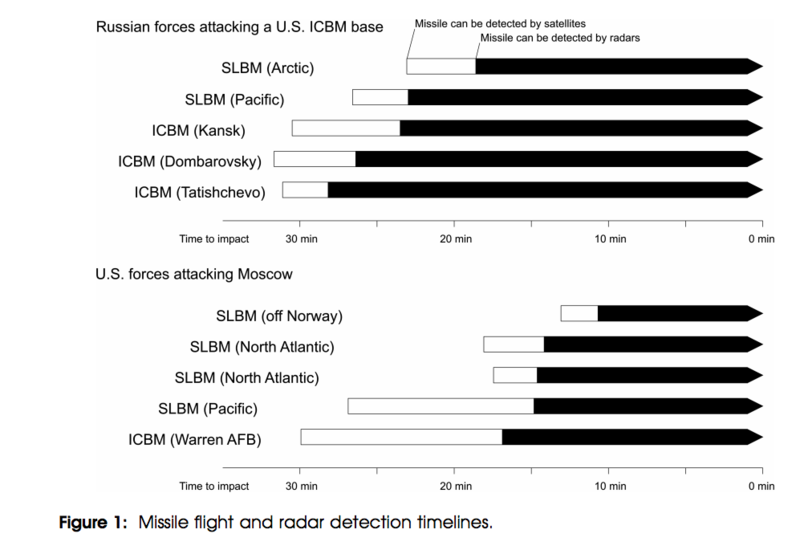 Even without satellites the warning time for an SLBM attack on ICBM sites in central Russia is much longer than it is for Moscow or other peripheral areas, to say nothing of Russia's SSBN force. Russia's geographic size makes any attempt at a successful US first strike "decapitation" scenario virtually impossible as long as there is some form of early warning radar. That's interesting. I always assumed that silo Topol-M deployment will stop at 60. It looks like it hasn't. I've seen reports about some activity (new construction) in Tatishchevo, but it may take some time to see what it is.